This is the last version of the particles template that makes use of the Duplicate Layer feature. It works very similar to the first version but instead of make all the duplication of the layers manually it is produced using the mentioned Duplicate Layer. Free Floating Off This is a new parameter from the old version. By defect the particles are free floating. It means that when they are shot they are unlinked from the particles source, so if the particles source moves they don't follow. They follow only the movement of a free projectile Animated and acts over all the particles at the same time. Boolean. 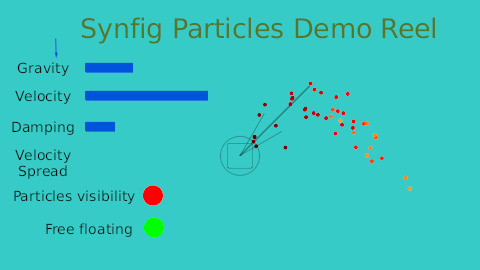 Particles Index: This is the needed exported value for the Duplicate layer. It should not be deleted or unexported. Also cannot be changed. small: this is a shared parameter to create the widgets. I have added some widgets to aid to know what are the current values of the parameters. See them in action in this screen shot. A small circumference. Its center is located at X Origin, Y Origin. You can directly manipulate that circumference to place the Origin of the particles source at different times. Select the circle under 'Origin' Group layer. A thin square box. It is the Xspread*YSpread random area where the particles are shoot from. It is dynamically link to its current value. Unfortunately I've not found a way to direct manipulation on it. Any idea? NOTE to me: Attach a circle composited to the values of the corners and split the XSpread and YSpread as converted types. Direct manipulation can be allowed. A long line (in this case points to 45 DEG with the horizontal. That's the current Alpha value. Two smaller lines showing an angle. Those lines represents the maximum angle values that the particles can be randomly shot. They are Alpha +/- Alpha Spread. Here is the template file. It is copyright of Genete but released for Public Domain. This is the version 2.3. TODO: deep explanations, more samples, upload the file. This page was last modified on 3 May 2015, at 02:48.